Nomination CountDown: This 2003 page is long closed. I'm thinking about starting a 2010 one. Feel free to let me know if you have a Favourite to nominate. The Details: Here's the very first favourites section. 8 people provided their nominations for a favourite cel from my site, and their reasons for picking it. Whenever I get around to closing off one Favourites page, I'll eventually start a new one (the old ones will remain accessible). While the cels won't repeat, some of the same nominators will likely resurface in the future. Either they will have multiple favourites to waffle through, or maybe a new favourite that hadn't been scanned yet. All entries are posted in the order they arrive (first to arrive, first on the page), so I won't need to decide what should go first. And, yes, I did sit down with my precious cels to have a long reassuring talk with them about this project. They now know not to take it personally if they aren't nominated, because peoples' personal preferences in characters and series will play such a large role in what they choose. The Point? I know my site's a bit sprawling, with all of the sub-sections. My hope is that this section will serve both as a guided tour, by frequent visitors, for newcomers, and simply as a way for people to have fun saying why certain cels appeal to them. Then there's my own curiosity about which cels people are looking at the most, and why. ALSO! I link to the cel sites of each nominator (click their names), so you can visit the galleries of the ones who strike you as being possessed of excellent taste! Episode #: Next 21: The Thousand Year Old Truth! The Traitorous Demon Dragon King! Comments: Maryu (demon dragon) Gaav. SPOILER! He surprises Lina, Martina, Milgasia, and Aqua obasan within the dimension where the (interactive) Claire Bible is kept. Aqua obasan deters the first attack. Gaav complains that it was a lot of trouble to find Lina, and declares that it's time to end it. 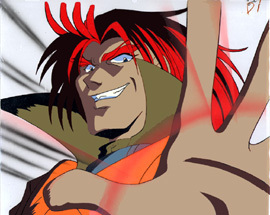 He raises his hand and shoots something like a fireball (though no doubt a super-charged one, coming from him) at them. Milgasia deflects it. 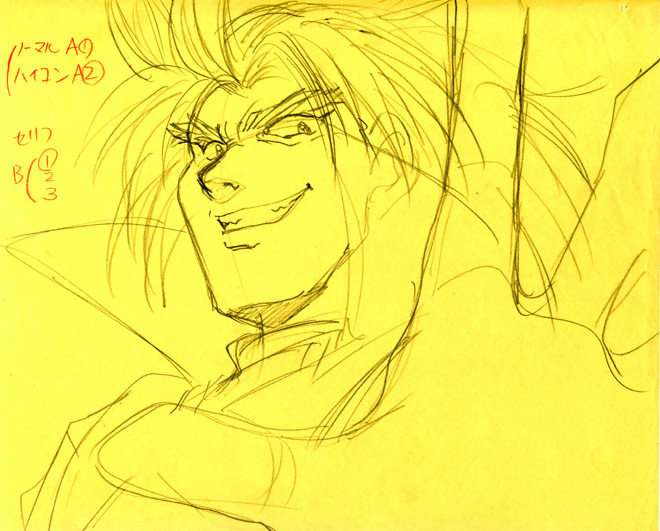 This cel came with 5 sketches, and I am gratuitously including scans of most of them. 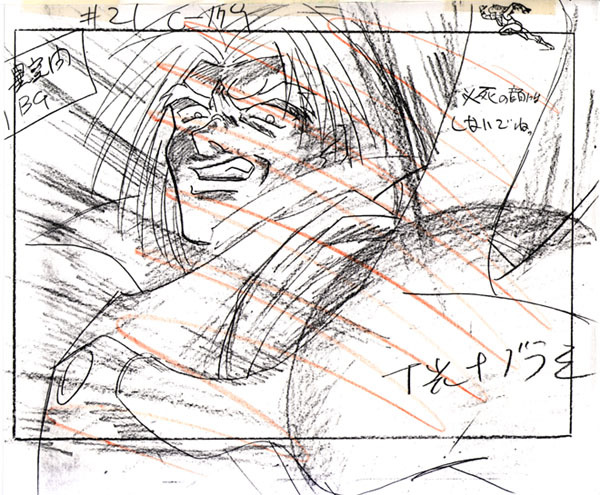 One of the genga is the same, one is similar but not identical. 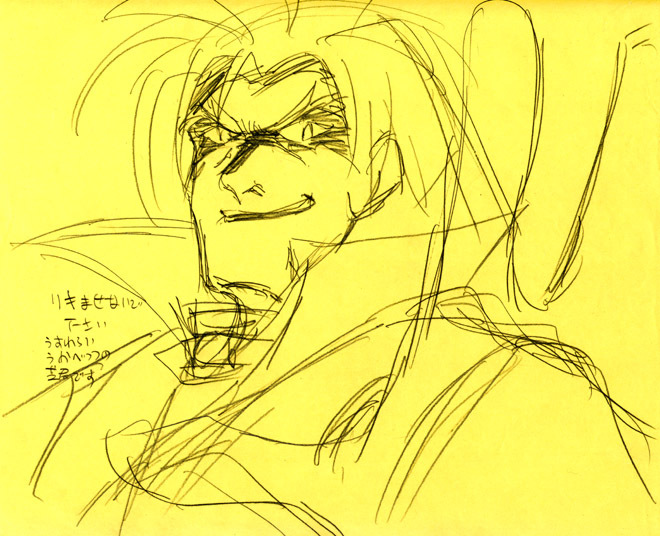 He has a different expression in the layout sketch (but it's still of the same sequence). And the A layer sketch simply looks interesting in its partialness. Episode #: 25: Shock!! Lightning Quick Conclusion!! Comments: Raiha, while watching the Koganei Vs. Shiju fight with Kurei, suddenly realizes he's left his precious Fuuko in the water pit for quite some time. Oops! Oh how I love this cel. It's one of my absolute treasures. So of course the colouring turned out blotchy in the scan. Wah! I'll try it again at a higher resolution very soon. This cel would be a little over halfway through the sequence (he's turning his head while gaping). 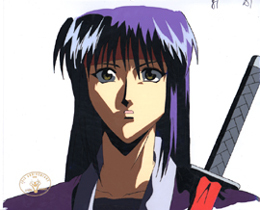 Nominated because: That Sakura cel is just so pretty. I'm sure you get comments on it all the time. The cel has an aura around it that almost makes it glow when you look at it. And yet, the image is so calm and demure. The colors are vibrant and give Sakura that overload of cuteness that she gets from time to time. Definitely a cel that could MAKE a gallery. Comments: This OP pan cel, despite the high sequence #, is the pride of my Sakura collection. The E6 layer is an outline plus the gold silhouette and the pink "background" (obviously it's not really a background). The scans were not cooperative. There are scanner lines, and the pink background wants to fade out to white. I might give it another try with the new scanner. Comments: When Zeru does a bit of strutting at the beginning of the Ankoku Bujutsukai (throwing off mass youkai and sparkage, at the expense of a chunk of the audience) to gauge whether Yuusuke is confident or an idiot (how about both? ), Hiei gets a good snarl in and thinks he's impressed that this kind of guy exists in the Ningenkai. 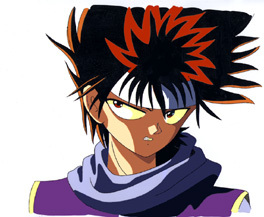 I guess we all know at that point who Hiei will be fighting. This is such a gorgeous cel! I love the flamelit colouring, and of course I love the outfit. 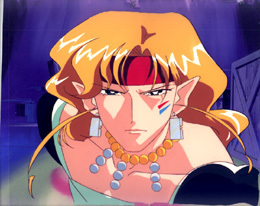 Nominated because: Just cause it's a gorgeous, actually serious-seeming, shot of my favourite fruity elf boy. Extra: Timing sheet. Came sealed with a Toei sticker. Comments: My nicest Tiger Eye, I think. After Naru-chan mortifies Tiger Eye by picking ugly unsophisticated Umino over his own beautiful self, Hawk Eye asks if he would like to see his wild card. Fish Eye rebukes the opportunity, but as you can see Tiger Eye is looking rather intent on seeing it so he can restore his poor damaged ego. The colouring is too red in this scan, so I expect it's in line for a rejiggering or rescanning. The background appears to be from right after this, when Hawk Eye is showing off the wild card. All you should see behind Tiger Eye at this moment is blue and black. Nominated because: This will probably surprise anyone who knows me, but I was always drawn to Mikage BECAUSE he was so emotionless. I admired this character's way of revealing absolutely no emotion. I remember when you first got it & posted it, I was just so incredibly wowed (if that is a word:) I immediately became incredibly envious & had it for my desktop for about a month ^^;; Colour-wise, I just love how the elevator provides almost a black & white background for a character (who at this moment) is obviously not. The expression on his face is just beautiful! 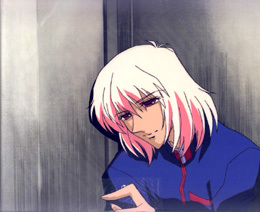 Comments: Mikage, huddled in his confessional elevator after Utena beats him up for telling the truth about her being after the same thing he is. He has always been said to be like a computer or robot, so he is completely bemused by the pain causing a tear to come out of him. He wipes the tear onto his finger, and starts lifting the finger to look at it. When you remove the layers with the hand and tear, it is also the moment shortly afterward when he is commenting that if he had not been wearing the rose signet he likely would have been killed. 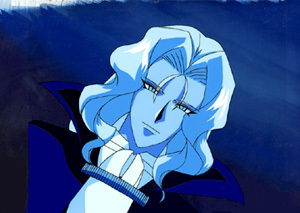 This was (and still is) my #1 Mikage dream cel. Nominated because: I nominated this one because I love Pan cels especially with backgrounds. Plus Valgaav looks so sublimely happy and macho at the same time. He looks extrememly pleased with himself. 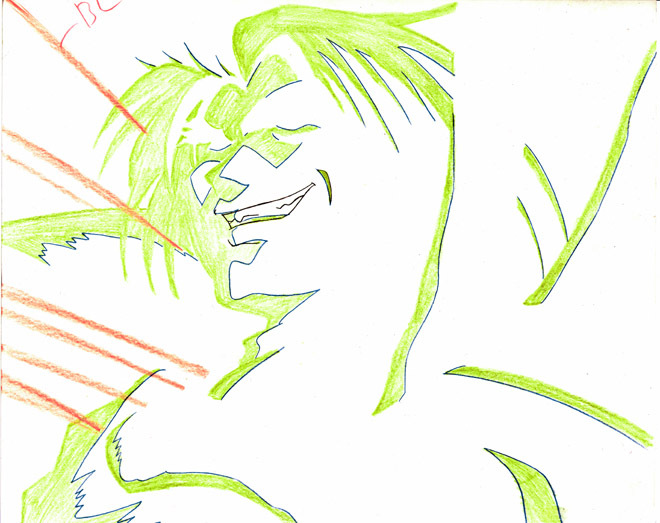 I think this cel really portrays Valgaav at his best. It's a gorgeous cel.